Let’s just break down and be honest about one thing: for the last four seasons, it’s been all about the Shotgun Sheilas and the Royal Pains. Beginning in 2012, these two teams traded the championship trophy back and forth while the Deadly Sirens and the Lovely Lethals just traded blows for bragging rights. Strange, too, from a fan’s perspective, how two teams as formidable as the Sirens and Lethals could have that much trouble on the scoreboard. Every team has its struggles, but if you’ve been paying attention, you know their lack of success on the win-loss front is due much more to the monstrous talent they face on the track than it is any shortcoming of their own. Well, with any luck, the 2016 season may be the point at which things take a turn. We have opined in the past about how Game 1s are pretty unreliable predictors of how the season will go overall, and we stand by that assessment. We’ve also talked about the cyclical nature of sports; if nothing else, the Kansas City Royals proved that to us last year. But it’s also true that change often begins with a whisper, and I think that’s what happened at B&D Skate Center Saturday night. The real story from this weekend’s games, of course, is the Lovely Lethals‘ 81-72 win over a Shotgun Sheilas team that hasn’t started a season at 0-1 since they were named the Fearleaders back in 2011. There are a handful of factors that likely played some role in this outcome: for starters, the Lethals drafted no new players for 2016, which means they’re all veterans now. Experience counts (the Sheilas have it too). 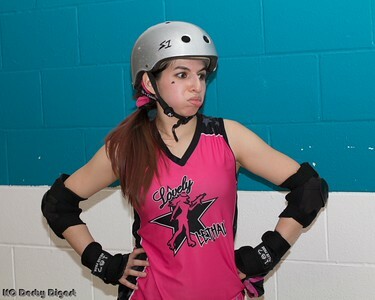 In addition, the Sheilas were playing without defensive nightmare Foxxi Brown, whose presence (and absence) immediately impacts the derby landscape. Also of note is what’s likely to be the season-long absence of jamming superstar Hittie Kittie, as well as the retirement of derby legends Dominant Jean and Lucha Lethal from the flat track altogether. And although the Sheilas only drafted four players themselves, that’s still four more new faces than the Pink brought into the fold, and the Sheilas’ various absences paired with the Lethals’ complete lack of fresh meat added up to a game in which the Ladies in Pink held the lead at every period break, and if memory serves, the Sheilas only tied the score up once while keeping it consistently close throughout and looking awfully good themselves. Lest you fret, let me assure you that we’re not seeing a decline in the Shotgun Sheilas — that’s what’s so great about this. What we’re seeing is a surge in the Lovely Lethals that’s four seasons in the making, and the very hallmark of a team that’s ready to get back into contention. If the rest of 2016 looks anything like this weekend, the Lovely Lethals are going to be a headache for any team they come up against in the near future. A massive headache, like one of those that starts in the back of your neck, runs up over the top of your head, and grabs the left side of your forehead, but not the right. 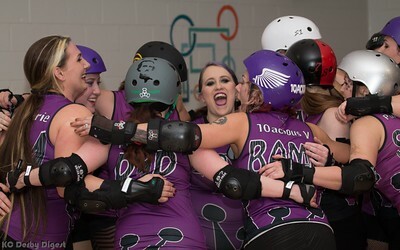 And speaking of headaches, the Royal Pains‘ 68-34 win over the Deadly Sirens came courtesy of quite a few new faces sporting the purple this season. The Royal retirees at the end of 2015 included jammer Pixie Hulk, relative newcomer Bullet Vixen, and legendary veterans Dixie Danger and Azz Catch-em. In addition, jamming powerhouse Lady Killshot has transferred to KCRW full-time, and defensive mainstay Mel Breakdown is out for the season as well. Their continued success in the face of such extensive roster changes speaks to some excellent coaching and several experienced veterans bringing their leadership to a group of very talented, malleable rookies willing to learn from some of the best in the league. Another trip to the championship game looks all but certain for Their Highnesses. Given the way they looked this weekend, I think the rug would have to be completely pulled out from under this team to prevent them taking another shot at the trophy. And folks, the Sirens looked good. Damn good, if you really want to know. Their game with the Pains was a very defensive, relatively low-scoring outing, and any team that can hold the Purple Passion to only 68 points has reason to hope yet. This is a team loaded with talent. Between star jammer and KCRW alum Bomb Pop, former Banked Beauty Johnson, multi-talented veterans Mojo Gogo, Sissy Facecheck, and Lily St. Slayer, and guaranteed future superstar Irritating Irish — just to name a few — there’s no telling the heights this Sirens team is going to reach once they find their footing. No, the game Saturday night didn’t go their way, and yes, they only mustered 34 points offensively, but believe me when I say the Deadly Sirens could well find themselves a major contributing factor to the championship games in 2016, directly or indirectly. Of course, Game 2 is going to tell us a lot more later this month, especially with this revitalized Lethals team taking on the Pains, and it may be a while before all four teams are back to full strength, for one reason or another. But gone are the days of two teams slugging it out for first place and the other two slap-fighting for last. What fans are going to love most about the 2016 season is that the playing field is more level than it’s been in years. All the pieces seem to be in place. As always, we have game photos from this weekend’s action. Click on Texas Outlaw’s attitude problem for the full album. 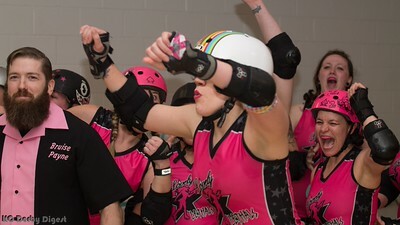 Don’t miss Fountain City Roller Derby‘s Ladies Division Game 2 on February 27th at B&D Skate Center. Don’t worry, we’ll remind you here and on social media as we get closer. The 2016 FCRD season is shaping up to be one to remember — don’t miss a moment!